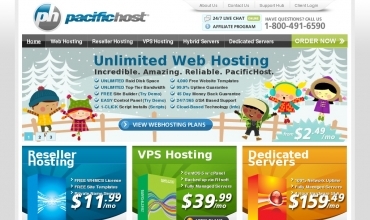 PacificHost continues to be a leader in hosting for small and medium sized businesses, as well as individuals and even Fortune 500 companies. They do it by using their customized tri-level hosting option and by being more than just good at what they do; the many awards speak for themselves. PacificHost is able to utilize their five data centers across the US, each climate controlled and each protected with around the clock security. Each facility offers top tier hardware and boasts multiple power backup systems, which allow PacificHost to guarantee 99.9% up time. Any problems or concerns are dealt with quickly and efficiently by their US based technical support. You will not be sorry if you move this direction, PacificHost knows what they are doing and will continue to be the organization they are. I like how fast the upload speed is. There is decent support as well. When I was in a panic one afternoon, I got Dave to help me after only about a half an hour. Because of that I can recommend them. I am happy with the features and am impressed that they have such good ones considering that it is shared hosting. Between the ffmpeg and all the fantastico deluxe options, I have done so much to my site. Pricing is excellent but after arriving there are problems that continue to drag along here. The support teams have occasional moments of brilliance but they are somewhat inconsistent which makes it tough to resolve things. So take a look but be aware. They are doing a satisfactory job of maintaining everything, although there have been some problems arise lately. So far I've not experienced anything major so will hang around. These are people who have a handle on things. They are not perfect but they are putting forth the effort necessary to take care of my business. I would recommend them for anyone. My sites with them have been handled fairly well although there are improvements they could make. Some of the pricing things are an issue as is uptime. However, they do seem to care so am giving them some time to take care of things.